Armpit (underarm) odor: causes, treatment and more! Home / Health A-Z / What causes armpit odor and how to get rid of it? How to get rid of the underarm odor? If you want to understand what causes armpit odor, we first need to learn a little something about how human body works. Similar to many other animals, humans are homeothermic creatures, and they maintain stable internal temperature regardless external temperature fluctuations. Therefore, there must be some ways allowing us to warm or cool down our body in order to prevent sudden internal temperature changes. One of the most important body-cooling mechanisms is perspiration (also called diaphoresis or sweating). Sweat is a liquid produced by sweat glands, and its primary function is to cool down the skin and prevent internal temperature rise. Humans have three types of sweat (sudoriferous) glands, eccrine, apocrine and apoeccrine ones (1). While eccrine glands can be found nearly everywhere on your body, apocrine glands are located only in axillae (e.g. underarm or armpits) and perianal area. Also, mammary (produce breast milk), ciliary (can be found in the eyelids) and ceruminous (produce cerumen or ear wax) glands are modified apocrine glands. Eccrine glands produce colorless water-based liquid, which cools down your body. The sweat made by eccrine glands is odor free. On the other hand, apocrine glands produce thick, milky texture sweat, which contains proteins, pheromones and "waste products (e.g. excess or unwanted substances excreted from the body)" and is responsible for body odor. Apoecrine glands (e.g. eccrine and apocrine glands combined) can also be found in your axillae and produce both water-like and thick milky sweat. The odor (smell) is caused by skin bacteria (such as Propionibacterium acnes or Staphylococcus epidermidis), which digest the sweat and break it down to propionic (or propanoic) acid and isovaleric acid. The propionic acid smells a bit like vinegar, while isovaleric acid smells like cheese. As apocrine glands are predominantly found in armpits (they release the sweat to local hair follicles), this is where most of the bad smell comes from. While eccrine glands are active since we are born, apocrine glands start work only in puberty (1, 2). This explains why babies do not have "stinky armpits". Also, apocrine glands are controlled by the autonomic nervous system (ANS), they are only active when your body is under stress (this is why you tend to perspire more while nervous). Let us take a detailed look at the three main reasons why your underarm stinks like hell - medical conditions, some foods and lifestyle habits. Some medical disorders, such as trimethylaminuria,diabetes, hyperhidrosis, thyroid diseases or kidney and liver conditions make your axilla (armpit) smell bad. Trimethylaminuria (TMAU) or fish odor (malodor) syndrome is a genetic disorder affecting the conversion of trimethylamine (TMA) from food to TMAO (trimethylamine oxide) through the N-oxidation process (3). Typically, the human body produces an enzyme called FMO3 (flavin containing monooxygenase 3), which is responsible for the conversion of TMA to TMAO. People suffering from fish odor syndrome do not make enough of the FMO3 enzyme (due to a genetic mutation) and cannot break trimethylamine to trimethylamine oxide. This results in trimethylamine build-up in the body and excess of it is released by urine, breath, and perspiration, which gives off a strong fish-like odor. As the apocrine glands in your axilla excrete trimethylamine, people with trimethylaminuria tend to have a foul fish-smelling underarm odor (4). There is no cure for fish odor syndrome. The only way to ease the armpit odor is by avoiding foods rich in choline, carnitine, nitrogen, sulfur, and lecithin, which increase trimethylamine buildup. Some of the foods you should not eat if you have trimethylaminuria are egg yolks, red meat, fish, and legumes. The only way to ease the armpit odor is by avoiding foods rich in choline, carnitine, nitrogen, sulfur, and lecithin, which increase trimethylamine buildup. Some of the foods you should not eat if you have trimethylaminuria are egg yolks, red meat, fish, and legumes. People with diabetes do not have enough insulin to break down sugar and use it as a fuel source or they do have enough insulin but their cells fail to respond properly to it. If your body cannot use glucose (sugar) as the primary fuel, it switches to fats. In such case, fats get broken to chemicals, called ketones, which become the main fuel instead of sugar. As the body cannot use all ketones at ones, it builds up in your body and is excreted in breath, urine, and sweat. High levels of ketones are associated with fruity (acetone) smelling breath and sweat. So, if your armpits smell like fruit or acetone, you may have a condition called diabetic ketoacidosis (5). This may be dangerous and even life-threatening so immediate medical attention is required. Excessive perspiration (hyperhidrosis) is a chronic disorder, which manifests itself by the production of too much sweat. People with excessive sweating tend to suffer from underarm odor as the sweat is broken into acid or cheese smelling substances by skin bacteria. Hyperhidrosis can, therefore, be one of the causes of armpit odor (6). Luckily, there are quite a few effective treatment options for hyperhidrosis, including topical agents (aluminum salts), oral drugs (anticholinergic agents, such as glycopyrrolate, methantheline bromide or oxybutynin) and alpha-adrenergic agonists (clonidine), iontophoresis and botulinum toxin (Botox, Rima, Myobloc, etc.) application (6). These treatments decrease sweat production and underarm odor through various mechanisms, some of which are known and others unknown. The thyroid gland regulates the metabolism. Some thyroid gland disorders, such as Graves' disease (severely overactive thyroid or toxic diffuse goiter) are associated with heavy perspiration and sweating and may be one of the reasons why your armpits stink. Graves' disease is an autoimmune disorder, which means that it is caused by a defect in our immune system. Pharmacotherapy: consists of administration of beta-blockers (relieves symptoms of heart palpitations - e.g. the sensation that your heart skips beats or pumps faster than usual) and thyreostatic drugs, such as thioamides (the most common ones are carbimazole and propylthiouracil), which lower the production of thyroid hormones (and decrease excessive sweating). Radioiodine treatment: consists of ingestion of a capsule or drink containing a low dose of radioactive iodine, which selectively partially destroys your overactive thyroid. Surgery: the thyroid is removed (completely or partially) in a procedure called thyroidectomy. So if you suddenly start to sweat a lot more than usual or have episodes of heavy night perspiration, it is a good idea to see a doctor. Studies show that chronic renal failure and liver diseases may worsen the symptoms of trimethylaminuria (fish malodor syndrome) (8). Some liver diseases are also associated with bad breath (halitosis), smelly underarm and foul body odor. Some fungal infections (mainly yeast or Candida) may cause an unpleasant armpit smell. Fungal infections can be topical (superficial x deep) or systemic. All of them may be associated with strong body odor (9). Taking medicines that increase sweating may be associated with strong armpit odor. Some of the medical drugs, which promote perspiration are pain killers, SSRI medication for depression, hormonal drugs, and cardiovascular medication (10, 11). The list is not exhaustive and you should always read the drug label to be sure that increased sweating is caused by the medicines you are taking. If your armpit odor is unbearable, you may ask your doctor about other treatment options for your disease but you should never stop taking any medication without a prior consent of your physician. If your armpits stink you should review what you eat. Food plays an essential role in body odor and avoiding certain foods may help you get rid of smelly underarm. We do not have many studies focusing on the association between foods and body odor, but we do know that eating some foods may worsen the problem. Cruciferous vegetables (Brassicaceae), such as cabbage, cauliflower, and broccoli may impair armpit odor because they contain sulfur compounds. The same applies to onions, garlic, and asparagus. Avoiding these foods is a good idea if you are trying to deal with smelly underarm odor. Drinking too much alcohol not only makes you drunk but it also has a negative impact on your body odor. Alcohol is converted into acetic acid in your liver and its excess evaporates through your skin pores, making your armpits smell like vinegar. A study performed in the Czech Republic back in 2006 shows that consumption of meat affects axillary body odor. Scientists tested how red meat affects armpit odor. They divided study participants into two groups. One of the groups ate meat for two weeks and the other group did not eat any meat. Both groups wore axillary pads to measure their underarm odor (12). The odors were then assessed by women for attractiveness, masculinity, and intensity. Results showed that the armpit odor of the "nonmeat-eating" group was significantly more attractive and less intense than the axillary odor of the "meat eating" group. While this was a small study, it still revealed that eating meat affects the underarm odor. It has been known for a long time that what breastfeeding mothers eat may affect the taste of their milk. This is why nursing mothers avoid spiced and herbs, like cumin, curry or fenugreek. These strong spices may also have a negative impact on your armpit odor, so you should consume them with moderation. When you are on a low-carb diet (e.g. eat less than 30 grams of carbs a day), your body uses fat as primary energy source, instead of sugar. Fat is broken to ketones, which have an intense fruit or acetone-like smell. Your body "leaks" excess of ketones through urine, breath, and sweat. This results in acetone-like armpit smell. The way you live also affects your body odor. Stress and poor hygiene may also contribute to stinky armpit odor. How does stress affect your underarm odor? As you already know, your armpit is a home to apocrine sweat glands, which produce thick, milky sweat. Apocrine glands are controlled by the autonomic nervous system (e.g. sympathetic and parasympathetic nerve fibers). When you are stressed or worried, apocrine glands increase the sweat production. More sweat means more "food" for skin bacteria and a higher risk of a smelly armpit. Sometimes your armpit smell is not associated with heavy perspiration but rather with poor hygiene. We sweat all the time, and when you do not take a shower regularly to wash the sweat off and freshen the skin, your underarm may still stink. The same goes for your clothes. Sweat gets absorbed by your clothes and if you do not keep up with your laundry, skin bacteria will start to break the sweat from your clothes, which will make your armpits smell like hell. Things to remember: Sweat is a natural product of sweat glands. It has several functions, such as body cooling and bacteria feeding. When released, it is odor free but skin bacteria break it into acidulous substances, which smell like cheese, vinegar or fish. Also, some disorders, such as fish malodor syndrome, hyperhidrosis, diabetes or stress, as well as some foods and medical drugs increase sweat production and make your armpits smell bad. Management of your armpit odor depends on the root cause of the problem. If you suffer from a disorder associated with increased sweating or excretion of waste products through skin pores, you should treat the underlying disease first. If you eat foods that may cause stinky armpits try to avoid them. If you take any medicines that increase sweating (such as antidepressants, pain killers, etc.) you should talk to your physician and ask about other treatment options if possible. In general, there are three main categories of armpit odor remedies - methods supported by evidence-based medicine, natural (home) remedies with anecdotal evidence and lifestyle changes. Here is a detailed description of individual methods, with practical tips and actual remedies. Stinky armpits are usually associated with hyperhidrosis (excessive sweating). While there is no treatment for genetic disorders, such as trimethylaminuria (fish malodor syndrome), decreasing sweat production may help you ease the problem. There are several evidence-based approaches to management of hyperhidrosis (13). If you sweat a lot you should use antiperspirants to control your perspiration. If the common products available in your local shops or pharmacy do not work, ask your dermatologist to suggest a stronger antiperspirant containing aluminum chloride. Aluminum chloride clogs your sweat glands and reduces perspiration. These antiperspirants should be applied as recommended by your physician. Usually, your doctor will tell you to apply them in the evening before you go to bed and wash them off in the morning. Anticholinergics are some medical drugs, which block the effect of acetylcholine (neurotransmitter, which activates sweat glands). An example of anticholinergics used for the treatment of excessive sweating is propantheline bromide (INN). These medications should only be used as prescribed and instructed by your dermatologist and you should also know that they may be associated with some side effects, such as constipation, dry mouth, urinating problems, stomach issues or blurred vision. This treatment of hyperhidrosis can be very effective and reduce sweating extensively. It involves treating of your armpit (or limb) sweat glands by a weak electric current. Basically wet pads shall be placed under your arms and electric current will be passed to sweat glands through this pad. The treatment is not painful but electric current may cause skin irritation or short-term discomfort. Iontophoresis usually takes about 30 minutes and you need 2 to 4 sessions a week every month (e.g. one week of treatment and two to three weeks without treatment) depending on the severity of your symptoms. Ask your dermatologist for more details and the cost of this procedure. Botulinum toxin is a poison, which, in small amounts, blocks the signals coming from the brain to sweat glands. It may be injected into your armpits to deal with underarm odor (about 20 injections per armpit). After the application, your sweat production will go down significantly and the effect of botulinum toxin injections last for 3 to 6 months. Then you need to repeat the procedure. Botox injections are an effective way for treatment of hyperhidrosis and while the procedure is safe, you may experience some side effects, including pain, redness, nausea, hot flashes or muscle weakness. Usually, these side effects resolve as the effect of Botox wears off. Usually, these side effects resolve as the effect of botulinum toxin wears off. There are lots of botulinum toxin injection based treatments available (Botox and Dysport being the most commonly used ones) and studies show that their effects are very similar (14). If the methods above do not stop hyperhidrosis, a more radical treatment will be necessary. This includes endoscopic thoracic sympathectomy (ETS) and surgical (or laser) removal of sweat glands. Endoscopic thoracic sympathectomy involves cutting of sympathetic nerves supplying the sweat glands. This blocks the signal from the brain and sweat glands can no longer be activated. Surgical removal of sweat glands involves the destruction of sweat glands in your axillae either by "normal" surgery or using a laser. These surgeries are performed in anesthesia (local or general) and can be very effective. They are usually permanent and should help you get rid of armpit odor. Ask your doctor for more information and pricing. Disorders associated with excessive sweating, such as overactive thyroid (Graves' disease) or diabetes must be treated by a medical doctor. Available treatment options depend on the actual disease. Sometimes, you will have to take medication (thyreostatic drugs, insulin therapy), other times a surgery may be required (removal of thyroids, etc.). There are many natural remedies, which may help you deal with underarm odor. There are no studies to back up their efficiency but they may help some people ease the symptoms of heavy sweating and armpit odor. Mix 2 tablespoons of baking soda powder with 1 tablespoon of cornstarch. Apply the mixture topically, under your arms, to absorb sweat and prevent smelly odor. Wait for 10 minutes before rinsing your underarms with clean water. ACV has strong anti-microbial properties and may be an effective remedy against bacterial growth. It is used in the treatment of fungal infections and UTI (urinary tract infection). And it may also decrease the underarm odor. 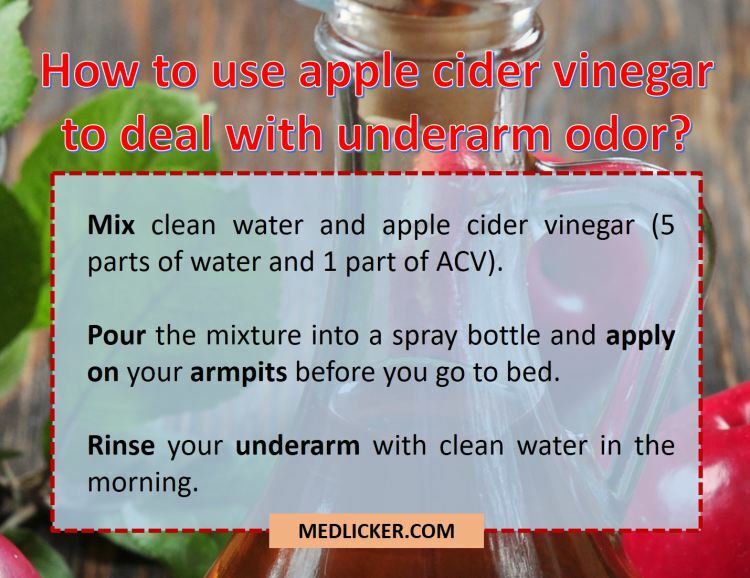 Here is how to make an apple cider vinegar remedy for armpit odor. Buy or get an empty and clean spray bottle. Mix clean water and apple cider vinegar (mix ratio 5:1, e.g. 5 parts of water and 1 part of ACV). Add a few drops of tea tree oil to improve the scent. Pour the mixture into the spray bottle and apply on your underarm in the evening, after your bath or shower, before you go to bed. Rinse your underarm with clean water in the morning. If you do not have a spray bottle you may apply the mixture using a cotton ball. Soak a cotton ball in witch hazel solution and wipe down your underarm. This prevents the growth of bacteria as a result of a change of your skin pH. Apply this remedy once a day before going to bed. Rinse your armpits with clean water in the morning. Lemon juice is acidic and lowers the skin pH, which helps you get rid of armpit odor causing bacteria. Add two tablespoons of lemon juice (from freshly squeezed lemons) to 150 ml of clean water. Pour the mixture into a spray bottle and apply on your underarm in the evening before going to bed. Rinse your underarm in the morning. One of the best essential oils for various skin problems is lavender oil. It may also help you get rid of the armpit odor. Here is how to prepare the remedy. Pour 100 ml of clean water into a spray bottle. Add 5 drops of lavender oil and shake it. Apply on your armpits every evening before going to bed. Add 1 teaspoon of hydrogen peroxide into 150 ml of water. Soak a cotton ball in this solution and apply on your armpits to kill bacteria causing the underarm odor. Your lifestyle may actually have a major impact on your underarm odor. The tips below will not cure excessive sweating but they may decrease your armpit odor by lowering the number of bacteria or masking the smell of sweat decomposition products. You should apply antiperspirants and deodorants to your underarm several times a day to mask the unpleasant odor. Antiperspirants contain aluminum chloride, which reduces sweat production. Try several products until you find one, which suits you best. If antiperspirants from shops do not work, ask your doctor to prescribe you a strong "medical" antiperspirant. Keeping your body fresh and clean is an excellent way to prevent or reduce the underarm odor. You should always prefer taking a shower to a bath as it is more hygienic. If you want to take the armpit odor prevention to the next level, try using some antibacterial soap to reduce the number of skin bacteria. Clothes made of synthetic fibers (nylon, etc.) make you sweat more. To reduce perspiration wear clothes made of natural materials, such as cotton, wool or silk. If you work out or jog, buy special clothes made of high-tech fabric to drain the sweat off your body. Wearing clean clothes is also important in the prevention of the underarm odor. Wash your clothes regularly and also change them frequently. Workout or jogging clothes should be washed after every workout or run to get rid of trapped bacteria and avoid bacteria overgrowth. Stress activates sweat glands in your armpits and makes you perspire more. While some level of stress is essential for coping with everyday problems, you should try to avoid too much stress by using some relaxation techniques or meditation. Find something, that works for you or ask your psychologist for help. Shaving your underarm regularly may help you keep skin bacteria in check. What is more, shaved armpits look much nicer than hairy ones. Just be careful about razor burns and shave your axillae at least twice a week. Smoking makes your underarm odor stronger and often bad smelling. What is more, tobacco is also harmful to your overall health and smoking increases the risk of lung cancer, cardiovascular diseases, and stroke. If you want to get rid of stinky armpits try to quit smoking. Alcohol and caffeine make your underarm smell stronger so cutting down on beer, wine, spirits, and coffee is one of the best things you can do to decrease your armpit odor. Some foods, such as spices (cumin, curry, fenugreek), cruciferous vegetables (broccoli, cabbage, cauliflower, etc.) may increase your underarm odor. The same goes for red meat and foods rich in sulfur, such as garlic or onion. Do not eat these foods and opt for foods rich in chlorophyll (e.g. kale or spinach), which improve your armpit smell. Also, make sure to stay hydrated (drink at least 2 to 3 l of plain clean water a day) and eat plenty of foods rich in magnesium (e.g. nuts, avocado, bananas, spinach) and zinc (e.g. pumpkin, dark chocolate, peanuts). Things to remember: Management of underarm odor is based on three principles. First, you should treat the underlying disease and hyperhidrosis. You should also avoid eating foods rich in sulfur and spices, which may increase your armpit odor. Keep your body clean and change your clothes frequently. Underarm odor and excessive sweating may sometimes be associated with serious medical disorders. you have other symptoms, such as excessive thirst, urinating, fatigue or fever. Also, make sure you see a doctor if the above-mentioned remedies and tips do not work or make your problem even worse. The heavy underarm odor may affect your life in a very negative way. It is a very embarrassing issue affecting millions of people worldwide. It is associated with medical disorders, foods and lifestyle habits. 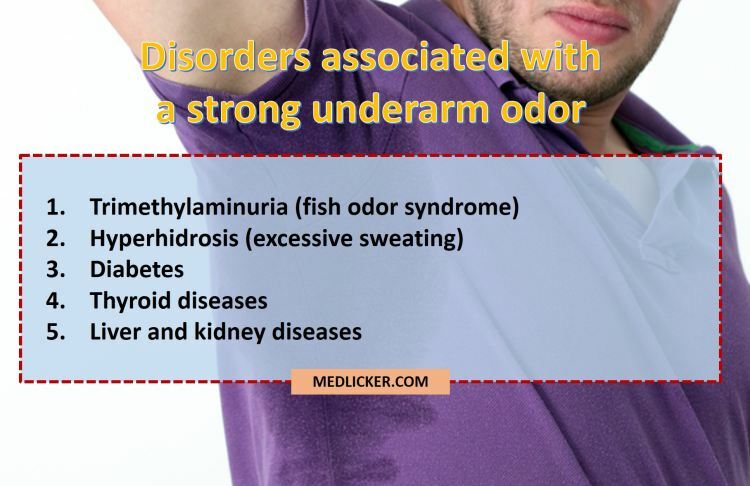 Some of the disorders, which may increase your armpit odor or make you smell bad, include fish malodor syndrome (trimethylaminuria), hyperhidrosis, diabetes, and thyroid or kidney diseases. The sweat is normally odorless but your skin bacteria break it down to acidic molecules, which make your underarm smell like cheese or fish. Therefore good lifestyle habits, such as regular showers, use of strong antiperspirants or wearing of clean clothes, may help you deal with armpit odor. Ask your doctor for proper treatment if your armpit odor is unbearable or if you experience other symptoms, such as night sweats, fatigue, frequent urinating or excessive thirst. Avoid eating spicy food, red meat, and foods rich in sulfur, which may increase the underarm odor. See numbered references in the article.